America’s Queen of Soul, Aretha Franklin, passed away on the 16th of August at the age of 76. Franklin might have been destined to touch us with her music because, as a child, she was already a gospel singer. She formally started her professional journey in the music industry after she signed up to Atlantic Records in 1967. Some of her most famous soul stirring songs include “Respect”, “You Make Me Feel Like A Natural Woman”, “Spanish Harlem”, and “Think”. 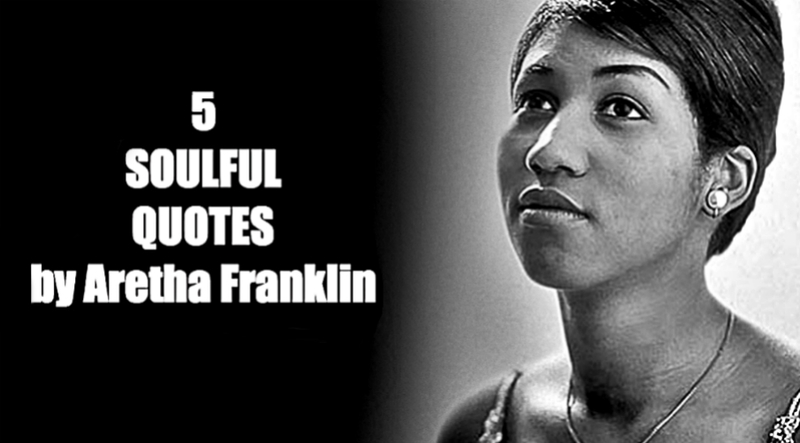 Aretha Franklin not only left us with her soulful music that is bound to live on forever, but also with her fruits of wisdom that are sure to touch our hearts. This quote is clearly expressed in Aretha Franklin’s most iconic song “Respect” where she earned two Grammy Awards in 1968. This song also inspired the Women’s Rights movement that they made it their anthem. As the song implies, you need to demand respect from others. You need to ask for it because they might have forgotten that it is your basic right. And if others can’t give it to you, you need to be bold enough to walk away. You deserve way better than that. 2. “You cannot define a person in just one thing. You can’t just forget all these wonderful and good things that a person has done because one thing didn’t come off the way you thought it should come off. Aretha Franklin’s music also suggests acceptance of others despite their imperfections. Just because people commit mistakes, the good deeds they have done will no longer matter. Every single one of us is trying to live the best life that we can, but there are just days that we slip. When someone disappoints you for not doing what you expect them to, try to look at their good deeds. This way, it’s easier for you to forgive them and give them another chance. Like Aretha Franklin, anybody wanting to live their life purpose doesn’t need to look it outside of themselves because it’s already within. Aretha’s natural talents changed people’s lives because she looked for the answers inside of her. You can ask for people’s opinions or guidance, but the inspiration and the true answers that you’re looking for to create a spark in your soul is already within you. Literally, Aretha had a weight issue that caused her health problems. Being overweight is not something to overlook if it’s causing health issues. But, she is quite right, it’s much better to have a big weight than a big head. Not all people with a little extra weight are harmed like people who have extra weight on their ego. A heavy ego will not just give you a negative outlook on life, but it will make your life miserable playing a game against yourself. Humility is a virtue Aretha Franklin maintained. Give value to the things that others give you regardless of how simple they might be. Learn to appreciate small good deeds because people don’t owe you anything in the first place. It might be better to give than to receive but to receive with gratefulness and appreciation delights the giver more. When you receive with a grateful heart, you will give back something more valuable. Giving things of value makes your life more valuable. And it’s how Franklin lived hers.